The guys enjoyed tea so much in Vancouver, they were ready for another. GJ and AJ are the best tea buddies! and a stop at the Tillamook Cheese Factory. Each of us received our own three tier server. La Tea Da has a very nice gift shop with tea and gift items. to continue our visit before deaprting for home on Tuesday. What a nice surprise to get to visit the tea room when you didn't think you could. It looks like you had a special meal with your family. I love the gift shop. What a lovely tearoom! I like the floral tablecloth and the teacups. The food on the trays looks delicious. When my kids were young we took the Amtrak train out to Oregon and down the coast. Beautiful scenery. Have a great weekend and thanks for sharing your tea adventures! How lovely! So glad you were able to stop there. Looks like another special tea room! But, honestly, you are making me jealous with all your tea room visits! Love this tearoom. Isn't it amazing that each tearoom has a different recipe for scones. The sausage roll is fun to see again and reminds me of how delicious it is. I am so happy you had the opportunity to have tea here and enjoy our Oregon coast. Did you try the cheese curds at the Tillamook Cheese Factory? Our family has always enjoyed viewing the cheese making process there (from the time our boys were little tots). I've found some interesting "tea" related things in the cheese factory gift shop over the years. And LaTeaDa --- I'm missing the beautiful fresh flowers that they usually have set on the 3-tiered trays --- usually carnations, alstroemeria, and baby's breath. I wonder if they don't do that any more? I'm glad you had a lovely trip to Oregon. What a splendid tea room ! So glad you was able to visit there, I'll add it to my 'must see' list, if ever I'm in the area. This looks so delicious!!! I see a couple of tea sandwiches with yummy Tillamook cheese in them! I LOVE it. I am originally from OR and that is the best cheese! This is one of my favorite tea rooms in Oregon. 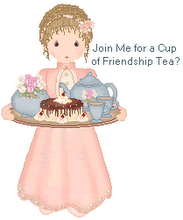 I have had some great tea times with friends. There's so much to see and do in the Tillamook area. Your shots of the gorge are beautiful...another favorite place to visit and not too far from my home in Troutdale OR! You'll have to let me know if you come back this way....I would love to meet you tool. There's a great tea place in Richfiled WA (about 45 minutes from my house) that I'd like to share with you...Myrtle's Tea House. Glad you had some sunshine too...it's been a cloudy summer. Linda, you've just made me resolve to have tea at La Tea Da when I am in Tillamook next month! My sweetheart's siblings have a reunion in that area every Labor Day weekend and I always want to have tea at La Tea Dah but no one wants to go with me. This year I'll have tea by myself. No more waiting! Thank you for sharing your wonderful experience. Your fellas really *are* the best! AJ's future wife is going to have LOTS to thank you for! I think their food looks outstanding!